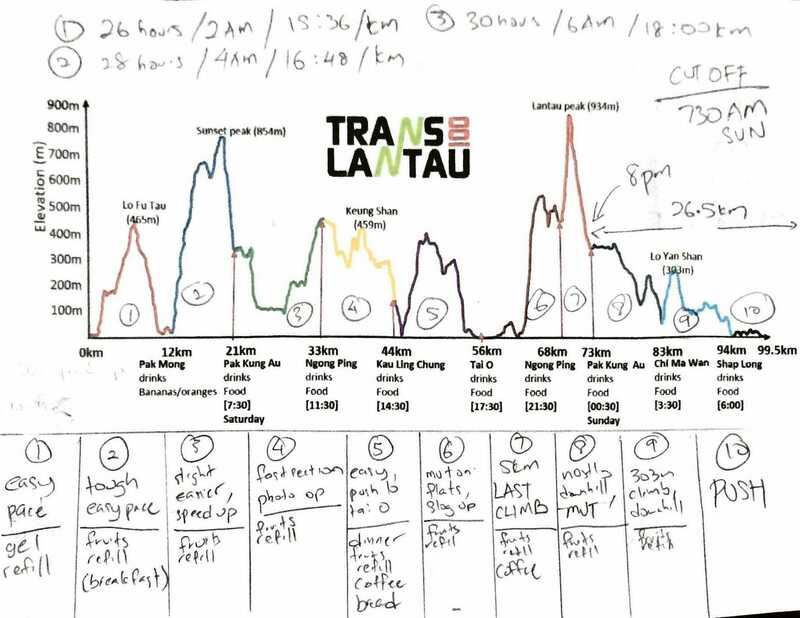 Translantau 100 is an ultra-running race with a cumulative elevation gain of 5,800 meters covering the most scenic trails on South Lantau. 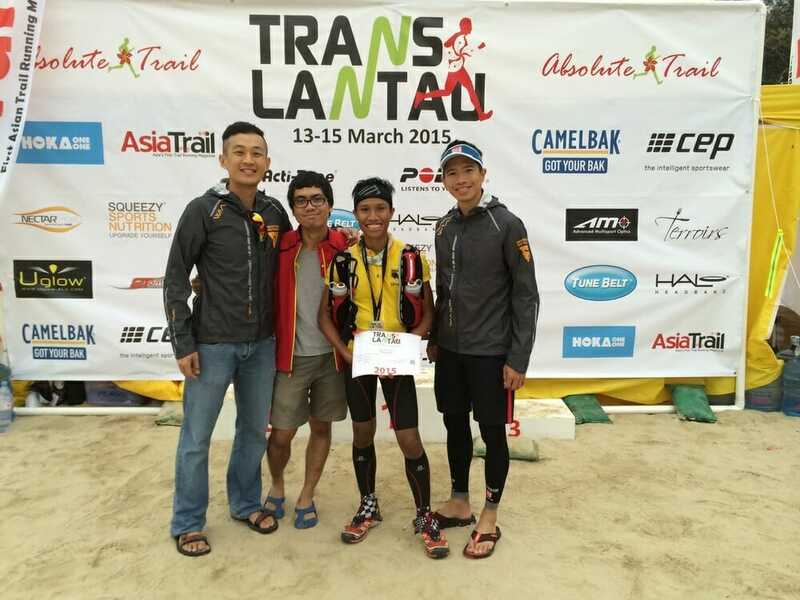 Currently in its third year, it has established itself as one of the toughest trail races in Hong Kong. 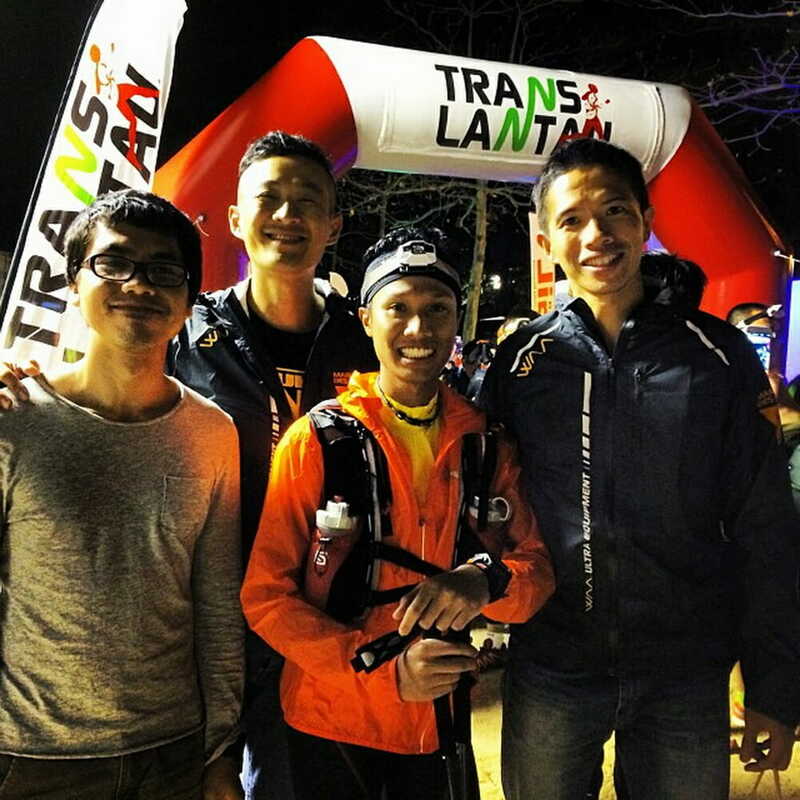 I took part in the Translantau 50km event last year as an introduction to the single-day/single-stage ultra-running scene. That race went well, so I decided that the time was right take on the 100km distance. 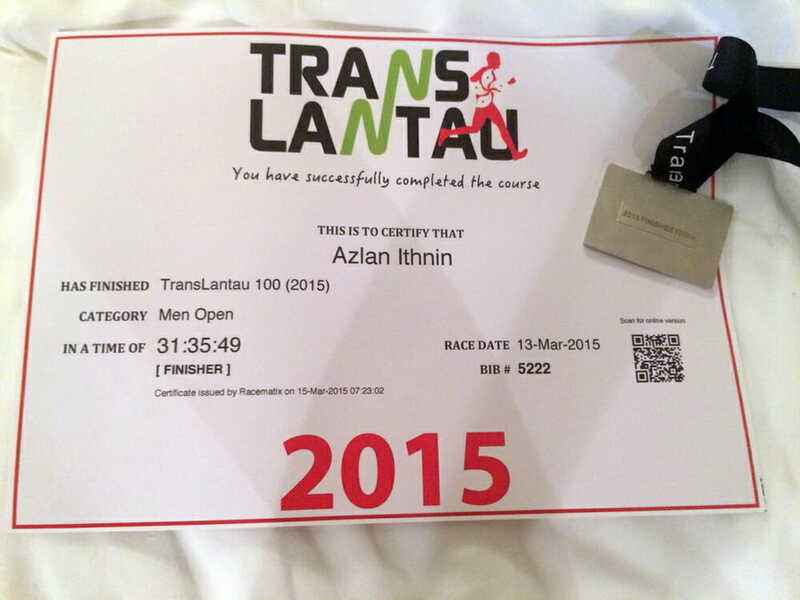 However, Translantau wasn’t the first choice race for my first 100km. 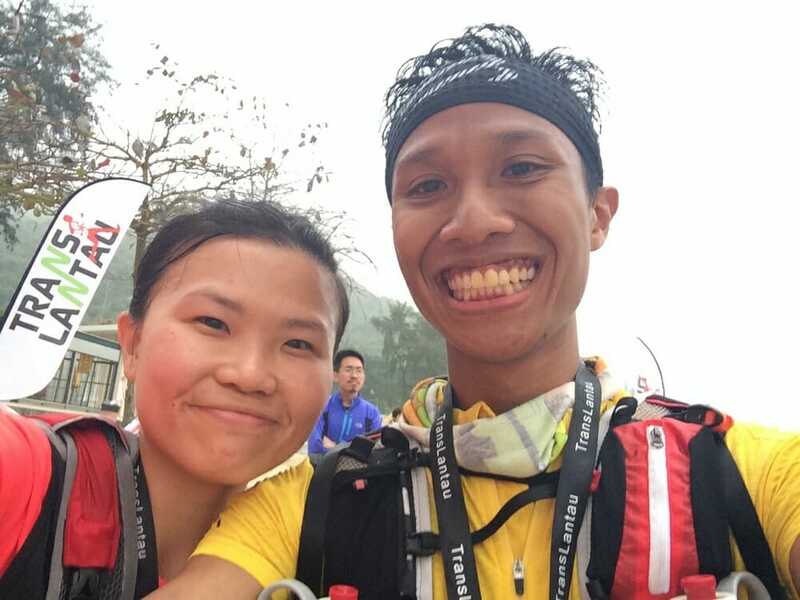 Prior to registering for Translantau 100, I had balloted for the Vibram Hong Kong 100, but was unsuccessful in getting an entry. And since my other friends were taking part in the their first 50km race, I guess it was fitting that I would be travelling with them as well to compete in my first 100km race. Training began as soon as I was done with the SCMS Marathon and continued into late February. Despite the longest run being only up to about 30km, I mixed up my sessions with hill repeats at Marang Trail, interval training at a stadium track, as well as easy 10km’s between the specific training days. 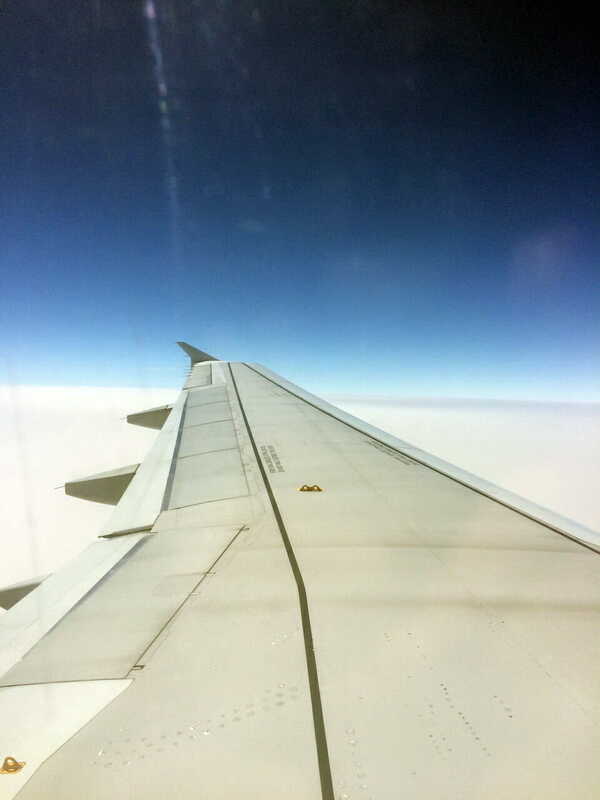 I didn’t get a window seat, but I managed to squeeze in this picture. Andy and myself were scheduled to land in Hong Kong at about 1:40 pm on Friday, but due to a delay we ended up touching down way past 2pm. It was a rush to buy a pre-paid SIM Card which was followed by a train ride into town to visit the RacingThePlanet store. After getting some stuff we needed, we grabbed some food along the way and rushed down to the ferry terminal to catch a ride to Lantau Island. By the time we reach the hotel it was close to 6pm. We quickly went over to pick up our race bibs before heading back to the hotel for dinner and some rest. 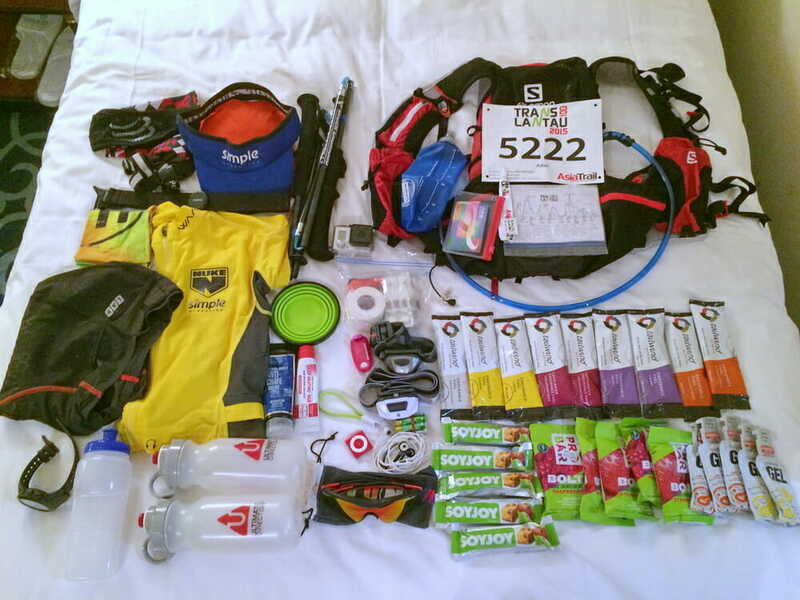 After dinner, it was time to arrange our gear for the race. Nothing much has changed in terms of what I had already been using for the past few races, with exception of a few notable items like a gaiter, a new running top and trekking poles. For this race, I chose to carry only bottles as my main source of hydration to cut the weight of the pack as well as avoid over-hydration. A new nutritional strategy that I have tried and tested way before the race would be the inclusion of Tailwind Nutrition, a US company which produces endurance drink mixes designed for ultra racing. It has worked well for me as it contributes 200 calories in an palatable drink mix which isn’t heavy and doesn’t upset the stomach. I have also replaced my earlier usage of GU Chomps with Probar Bolts as I find them much less stickier in the packet and gives a great boost of energy, especially the ones with Caffeine content. Click one of the links below to see the gear I used for the race. A quick run down of my gear on the hotel room bed. Besides equipment planning, race planning was critical as well. As such, I took the time the day before the race to get a print out of the course profile while adding my own little notes to it. The course profile was later kept in a zip lock bag and I carried with me during the race. My own little course profile and notes which came in very useful for the race, despite not meeting the timings I wanted. Despite not having much sleep since landing in Hong Kong, I managed to get myself up to the start line at about 11pm, checking out the sights and sounds while getting myself in place for the race. The race flagged off at 11:30pm sharp. The route for the starting stage was the same as the 50km race. Despite the cooler night-time weather, I regretted putting on the wind jacket from the start, as it made me sweat heavily early into the race. After running and climbing for about 15 minutes, I stopped by the side to take off the jacket and I felt much after that. Given that the early parts of the course was quite narrow, I got into a good pace to avoid being stuck in a congestion. But a mishap occurred when my shoe got briefly soaked into a puddle of water as I was trying to avoid falling down. After exiting that section, I stopped to adjust my insoles before making my way to the next check point. After a quick stop for food, I put on my gloves and made my way up a flight of stairs to the next stage. The climbing got pretty intense on this stage. It was harrowingly cold up in the open mountain areas, with temperatures dropping to about 18 degrees. This section was where I experienced true mountain weather; cold, rough and unforgiving. My excitement of going through this stage was interrupted by the reality that I was alone in the mountains and a single mistake could be life threatening. The damp weather made it difficult to navigate the slippery rocks, causing a number of runners to tumble during the descents. The heavy mist made it harder to see whats in front or behind you, even with the strongest of headlamps. This resulted in a group runners which were ahead of me taking a wrong turn and back tracking to the path where I was heading to. Eventually after what seems like a long cold descent, we made it out to the next check point. This section was a welcome relief for most runners. 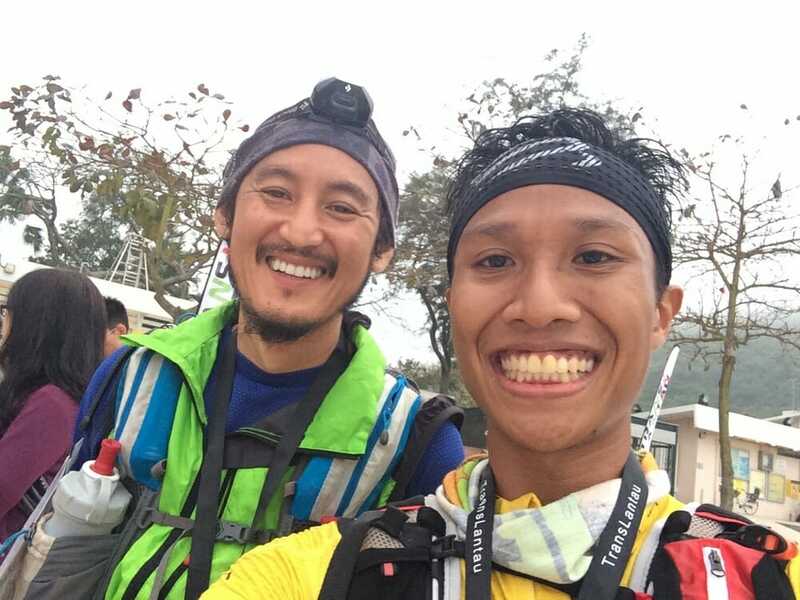 It was a flat concrete road for a few kilometers with some benches scattered around, giving runners a bit of time to rest their legs as well as pack up their cold weather gear and headlamps. I walked and jogged this section for a while before entering what would be the trail route for the Lantau Vertical race. This route was familiar to me, so I was comfortable navigating this section before reaching the next check point. This section was quite hazy in my memory. But I do know I made a quick stop here before pushing off for Tai O.
I felt mentally exhausted going into this section. I felt really sleepy which affected my pace and this made me have a hard time trying to catch up with the runners in front of me. Still, I pressed on knowing that I would eventually reach the seaside and I would be half-way into the race. Clarabelle, a Singaporean runner and myself got a little lost at the bus terminus as we didn’t know which direction the flag was pointing to. After running around for a while, we grudgingly found our way to the check point located inside a school. We had a short but fruitful rest, sitting down to eat cup noodles, fruits as well as topping up our hydration bladder and bottles. The students who attended to us were pleasant and helpful to our needs. Some were probably amazed at what we were doing and even asked where we were from. After thanking them for their hospitably, we made our way out of the check point with a couple from Hong Kong as well as another runner. I had considered quitting the race at this stage. The problem was that I had already walked at least a kilometer or more until the entrance of the trail head. Thus it felt stupid to quit now knowing that you still had to walk back to the check point. So with a little encouragement from Clarabelle, I sat down for a while, packed my headlamp and jacket into the side of my WAA jacket and grudgingly made my way up the hill. I told myself to get through this 540m climb first and decide later what happens. It was a brutal uphill bushwhacking session, because you had to pull yourself up using the branches at the side to make your way up. Darkness was falling fast by then and we were lucky to reach the cable car station with available light. It was dark by the time I came to this check point, this being the last one before the last major climb up Lantau Peak. Again, I wanted to quit at this check point. But it was there that I bumped into Louis, who I was very surprised (and happy) to see, as I thought that he surely would have been way ahead of me. He was having issues as well, thus his speed. With a little bit of encouragement, I once again grudgingly headed to the trail head to begin the ascent. It was a painful and steep ascent. I was sleep walking and hallucinating during this stage as it felt like it could go on forever. There was a bit of confusion as to whether the path leading to Checkpoint 8/9 was the correct one. After making a call to the race director and venturing out further, we figured that it was the indeed the correct path. So much time wasted! But I guess this was a result of not sleeping for the last 30 or so hours. Clarabelle and I arrived at the second to last check point before the finish with maybe 1 to 1.5 hours left to run. We were really short on time and to finish with a bit more buffer time, we started off running intermittently along the more run-able sections of the trail. I guided Clarabelle to the exit of the trail while informing her that I would try to run all the way to the finish line myself. And so I gave it my all but at the cost of my Achilles tendon shooting up in pain just prior that. Eventually I crossed the line with about 25 or minutes left on the clock. At the finish area with the finishers cert, something new from the organizers this year. With Louis and his ever infectious smile, regardless whether he’s in pain or discomfort. With Clarabelle! A Singaporean I bumped into at Check Point 2 or 3. We ended up running together till the end of the race. I think I would have quit the race early if she hadn’t dragged me through some my worst patches in the race. With the team at the finishing line. I felt relieved the moment I crossed the finishing line. Not the finishing line high, but a relief that I had completed the race before the cut off time. I was exhausted but I stayed around for a while to chat with the last few runners crossing the line as well as my team mates and other friends who were there. I eventually crashed much later on the plane ride home and when I got back to my bed. The race definitely gave me a renewed sense of possibility in very much the same way my first marathon did. The completion of this distance has given me the confidence to attempt that distance again and maybe even further. There were many moments in the race where I felt unsure, uncertain and lost about where I was and what I was doing. At times I felt that I wasn’t going to make it to the finish line. I was difficult to keep your mind in one place while having your body moving in another. But throughout the race, I did manage to do one thing right which was keep putting one foot forward, which eventually got me through to the end. Looking back at it now, I had no regrets pushing myself the way I did, even though I was very close to quitting at times. A shout congratulations to everyone who took part especially the Singaporeans that were with me and I know who were taking part in the 100km; Terence, Louis, Clarabelle, Kim Lai and others. Also a big thank you to all my friends and acquaintances for your encouraging words on my Facebook wall during the intermittent times I was checking my phone. A finishers certificate, which was new to the race and the finishers medal. 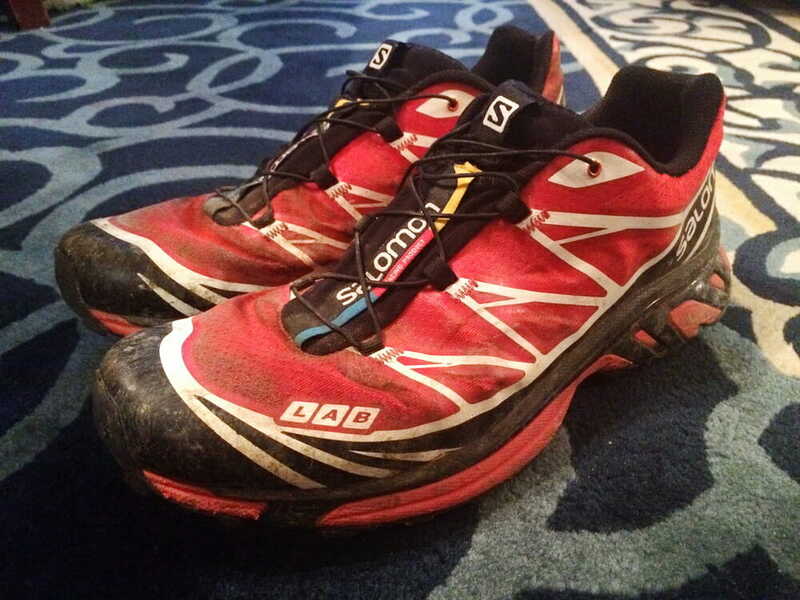 And the shoe that took me safely through the rugged high country of Lantau, the Salomon XT6. Click to view the data on Movescount or Strava. I did only the 25 Km race. Absolute respect for your completion of the 100 km race.